Underdog Rescue of Florida – Never Underestimate an UnderDog! Your contributions will enable us to save more lives. Any amount is greatly appreciated. Our next event will be held at Pet Supermarket on Saturday, May 4, 2019 from 10:00 am till 2:00 pm. Their address is 4238 53 Ave E, Bradenton, FL 34203. 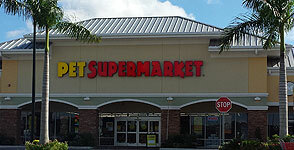 Pet Supermarket is located on State Rd. 70 in the new Publix shopping center at the north end of Lockwood Ridge Road. There will be several UnderDogs on hand who are eager to meet you! For an opportunity to be "pre-approved", please fill out an online application now. We are looking forward to seeing you there! Join us Saturday, April 20, for an UnderDog Rescue Adoption Event! Come meet adorable and ADOPTABLE dogs here at the store from 10-2! Pawsitively Pets is located in the Bennett Plaza next to Riccos Pizza. The address is 5238 E State Road 64, Bradenton, FL 34208. Phone:941-745-8511. Fill out an online application to get pre-approved. See you there! This is a non-emergency message line checked 3 times a week. The quickest way to reach us is by email.